Traveling across the country with animals in tow is a regular experience for our dedicated zookeepers, but when curator Martin Ramirez offered me the chance to tag along and document the move of two African lions, I jumped at what for me was a once-in-a-lifetime road trip! This map traces the 16-hour route we traveled this month to deliver maturing lionesses Busela and Nobuhle to Hogle Zoo in Salt Lake City—all part of the Species Survival Plan conservation breeding program that will eventually pair them with two mates in their new home. Long before the road trip ever began, keepers and vet staff worked closely with the animals to prepare them for the transition with crate training, diet prep and health checks planned for before, during and after the move. The animal care staff is dedicated to ensuring these trips are as quick and stress-free as possible for all passengers, which also means reaching out to zoos along the way in case assistance is needed. 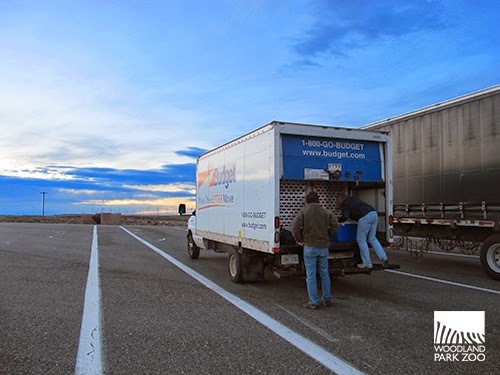 Sometimes animals are flown or shipped, but because we were transferring two lions at the same time to a fairly close destination, we decided it was all about the moving truck. Stop 1: Prep and Loading, Woodland Park Zoo, Seattle, WA. Martin met me in the zoo’s parking lot with the moving truck at 5:30 p.m. on Monday night. I threw my duffle bag full of camera equipment, a zoo sweatshirt and a large supply of Cheetos into the follow-car (a white Ford Escape Hybrid). 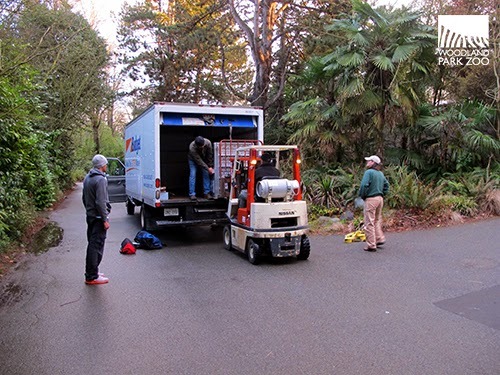 The follow-car’s job is to trail the moving truck, watch for any problems and provide support (and snacks) to the team. We even had walkie-talkies to chat between cars; it was super official. We drove into the zoo to pick up both the lions and their keepers, Pam Cox and Jason Sorstokke (both having remarkably less luggage than me), who met us outside the feline house. 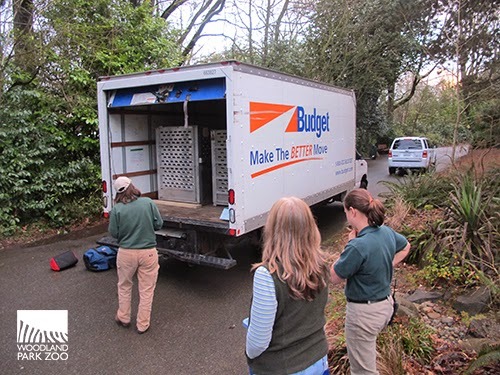 After a pep-talk and safety reminder from collection manager, Pat Owen, keepers Pam, Christine and Nikki went into the feline house to transfer the lions into their crates. Getting two 200-lb. cats to shift from their exhibit into their crates is not easy, but fortunately the keepers had been practicing the move and it certainly paid off. We waited patiently outside the exhibit while the keepers asked the lions into the crates. 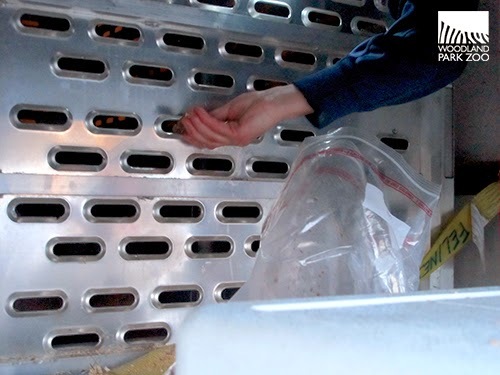 When the lions were secure in their travel crates we then had to lift them into the moving truck. Lanny Kittleson, warehouse lead and skillfully smooth fork-lift operator, hoisted the crates into the back of the truck and secured the crates into place. Zookeeper Nikki does a double check on the lions’ well-being before we depart. As I tried to peer into the crates in the setting sunlight I couldn't see much of anything and almost wondered if there were really any lions inside, but a low growl from one of the girls assured me that yes, all lions were aboard. Keeper Christine made sure we had a plentiful supply of water and meat snacks for the lions’ trip. She also provided a large amount of their favorite food so that the keepers in Utah could slowly transition them to their new diet plan. Here she is talking about the diet prep for the trip. Video: Keeper Christine talks diet prep. Then, with some heartfelt goodbyes and bon voyages from their dedicated keepers, the lion sisters and their convoy were off on I-5 south! Stop 2: Some light pawing and a check-stop, Battleground, WA. 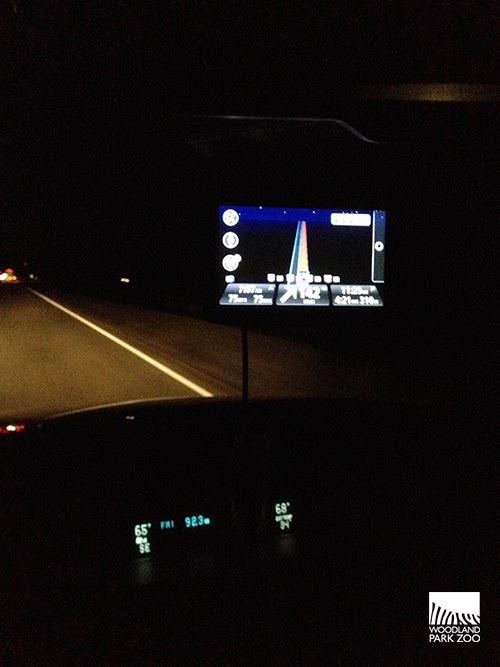 As we rolled along the freeway all I could hear was the soothing sound of the interstate. Martin and I were in the follow-car while Pam and Jason led the way in the moving truck. We were almost to Portland when we heard one of the walkie talkies buzz and Pam’s voice ask “Lion check at the next rest stop?” “10-4” we replied. The next rest stop happened to be right outside Battleground, WA. We pulled into a spot farthest from the restrooms and other travelers. Not that we had much company on a Monday night, but we didn’t want to draw any unneeded attention to a moving truck full of lions. Pam met us at the back of the truck and explained that she had heard some pretty loud pawing during the last few miles. We needed to check to be sure the lions were safe and secure before we continued on. Pam slowly lifted the door and we peered into the back with our flashlights—no lion problems! The lions were snug in their crates, but it was easy to see what the pawing noise was from. Busela had kicked out most of the wood chips from her crate onto the moving truck’s floor. She had been very busy redecorating her carriage. Other than a few scattered wood chips, there were no glitches with our passengers. 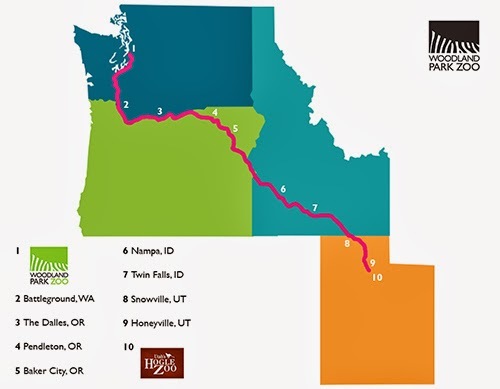 Next stop, The Dalles! Video: Checking on lions at night. Stop 3: Gas station surprise, The Dalles, OR. We sneaked along the starlit Columbia River into the town of The Dalles and needed to gas up before heading over Deadman Pass and the Blues. At the height of the Oregon Trail days, the Blues were a formidable mountain range on the way to Oregon City. The traverse is a little smoother today with I-80 gliding over the peak at 4,193 feet, but you wouldn’t want to get stuck on this steep, windy road. The West 6th Street 76 welcomed us with a cheerful gas station attendant as only Oregon can. There is something so comforting about a gas station at night, a quick chat with the attendant, a respite from the road. A smiling, freckled young lady chatted us up as she filled the pump. We told her that we were from Woodland Park Zoo and that we had a very special delivery for Utah. As if on cue, one of the lions gave a nice little pound on the side of her crate, making the gas attendant a tad nervous. “What kind of special delivery?” she prodded. When we told her we were hauling two lions she nearly jumped back from the moving truck. “Seriously? That is so freaky… and really cool.” It is really cool, I thought, these young lions are ambassadors for their species and we are all part of this benchmark move in their species survival program. The attendant nervously listened to the side of the truck for any roaring, but the lionettes were pretty quiet. “Good luck”, she said, “you have the coolest job in the world!” I think we all felt that way as we headed for the Blues. The view for the majority of the 16 hour drive looked like this. I was tempted to grab some photos of my napping cohorts, but I’ll be nice and not publish them here. Stop 4: Watering hole, Pendelton, OR. In the middle of the night, in the middle of our trip, in the middle of nowhere we stopped outside of Pendleton, Oregon to check on the girls and make sure they had enough water and a few midnight snacks. Pam climbed into the back of the moving truck and skillfully filled their water troughs. She also slipped them a few chicken strips and asked how they were doing. Pam is magic; she understands animals in a way I have come to truly appreciate. Remember when you were little and you read storybooks about zookeepers and their remarkable affinity for the animals they care for? Well, Pam is that kind of keeper. It’s a quality in zookeeping that is hard to define, but at the core it is kindness and devotion. Please forgive this poor documentation of Martin checking on the lions; the photographer was extremely tired during this leg of the trip. Stop 5: Watering hole II, Baker City, OR. The humans needed caffeine and sugar, the vehicles needed gas. 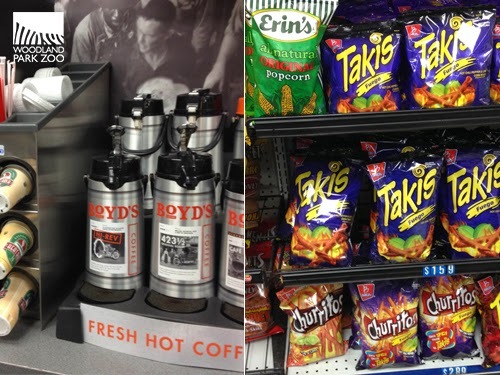 There’s nothing quite like Takis and gas station coffee to round out a road trip. I’m not condoning this sort of nutrition plan, but it was essential to our expedition. We each took turns going into the snack station since someone was always stationed outside to watch over the lions. Stop 6: Lion breakfast at dawn, Nampa, ID. The sun rose between Baker City and just outside Nampa where we stopped at a rest area once again to check up on the lions and give them a breakfast snack. Feeding the lions in the crates is a little difficult, but Pam managed to get the raw chicken strips into the crates without too much trouble. She offered each of the girls a few handfuls of meat through the slip in the crates, but they weren’t too interested in breakfast. 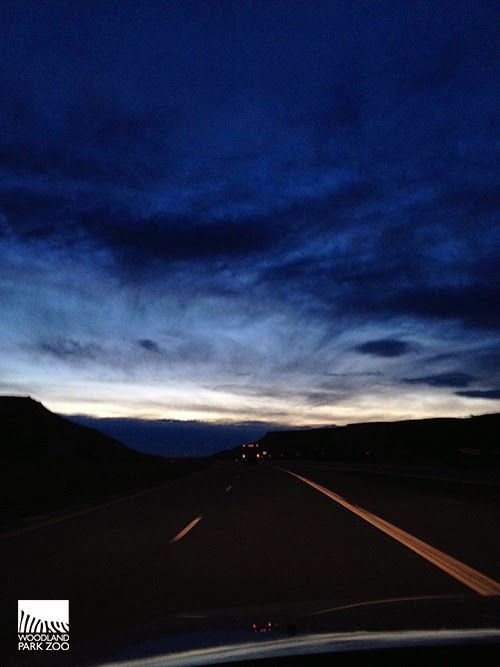 The beautiful sunrise as we headed east. You can see the taillights of the lion-mobile in the distance. Here you can see how Pam slips some chicken to each lion. It was a beautiful spot for the lions’ breakfast. Stop 7: The lions roar at dawn, Twin Falls, ID. The humans stopped for a quick breakfast in Twin Falls, as well as some more coffee. The lions began to roar a bit back and forth, either because they wanted our breakfast or because they were ready to be in Utah. It’s a long drive and the girls did really well in their crates, but I’m sure they were ready to be there—we certainly were at that point! Stop 8: Snowfall in Snowville, Snowville, UT. It was snowing as we finally crossed the state line into Utah! (I didn’t catch a photo of the “Welcome to Utah” sign because apparently I had dosed off.) 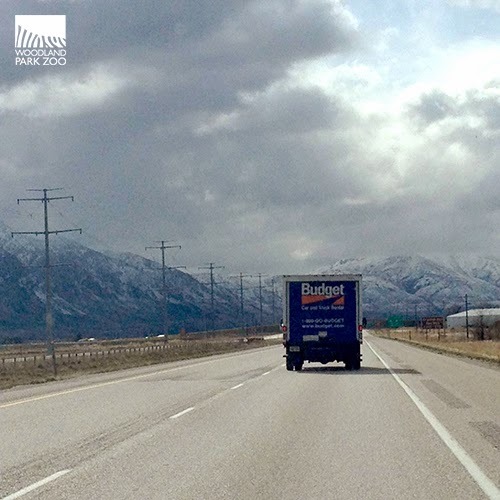 Here is a photo of the beautiful snow-capped Wasatch Mountains north of Salt Lake City. We were really excited to be at Hogle and we only had a few hours left! The lion-mobile finally reaches the foothills of the Wasatch range! Our last stop before our big arrival at Hogle Zoo was a quick check on the girls in Honeyville, Utah, just a half hour outside of Salt Lake City. We pulled into a gas station next to a sunny farm field. Pam and Martin both climbed into the truck to do a visual check on the lions. Both girls were lying down and seemed to be calm, a good temperament before their transition from the moving truck to their new space at Hogle. The sun was shining, the snow was just beginning to catch up with us and in a few more miles we would be unloading the lions at their new home! Stop 10: Home, sweet, home, Hogle Zoo, Salt Lake City, UT. Woohoo! We finally made it to Hogle Zoo! We were welcomed by about 40+ Hogle Zoo staff at their brand new African Savanna exhibit. Hogle had been anticipating our arrival, so the staff there were really thrilled to see us pull in and welcomed us with lots of cheering and smiling. Everyone was ready to help us unload the crates and get the girls settled into their dens. The snow was beginning to fall, a fitting nod to this ski capitol, as we unloaded our gear and prepped the crates for the move into the lion yard. First the crates were lifted from the truck with a forklift and placed closer to the lion yard. From there, the Hogle staff used manpower (and womanpower) to carefully shuffle the crates to the lions’ indoor space. 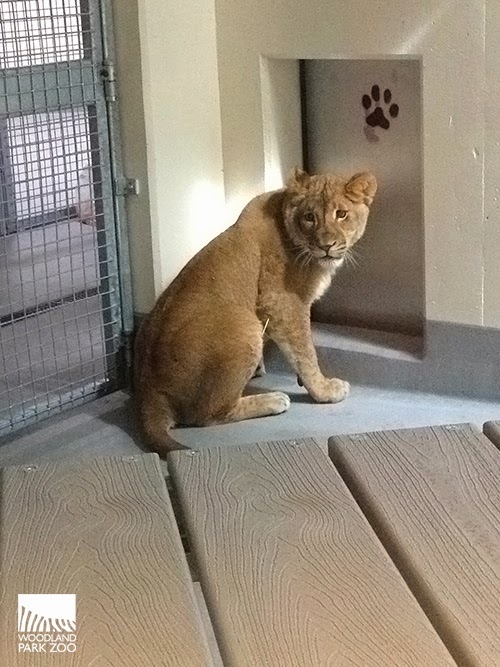 After securing the crates to the outside wall, a keeper on the roof of the feline house lifted a cord to open the crate door which allowed the lions to exit their crates and enter their indoor space. Video: Woodland Park Zoo arrives in Salt Lake City and teams assist in transferring lions from the transport truck to the new lion enclosure at Hogle Zoo. It took a few minutes for the girls to get up the courage to shift into the indoor area, but once they did they sniffed out their new digs and settled in. They were kept in separate enclosures during their first night, but after that the sisters were reunited with a lot of snuggling and neck rubbing. Keepers at Hogle tell us they are doing quite well in their new home! Video: Lion keeper Tonya describes the girls' first night in their new home at Hogle Zoo in Utah. The lion sisters were brought to Hogle where they will live together in the new 4.5 acre African Savanna exhibit. Hogle Zoo is just now putting the finishing touches on their 4.5 acre African Savanna exhibit. Erica Hansen, communications coordinator, gave us a special sneak peek at the new space. You can see they are still working on a few elements of the exhibit design, but soon the grass will begin to seed and it’s going to be a great space for our girls to romp and play. They’ll have two watering holes, one of which can be heated or cooled depending on the weather. There are places to sit up high and look over the panorama featuring giraffes, zebra, ostrich and other small antelope, as well as cozy spots to nap. Video: Erica Hansen shows us the new lion exhibit, part of Hogle Zoo’s African Savanna landscape which is just in the final stages of construction. When we finally had the moving truck cleaned up and ready to return I felt a little sense of elation. It was sort of the last step in this big move and I was definitely exhausted and ready for some sleep. Even though the trip went as smoothly as possible, it was a big move for these two lions and we all felt a sigh of relief when we were assured that they were settled into their new dens. I’ve always thought that being a zookeeper was quite possibly the coolest job in the world, and spending time with this dedicated crew proved it. The keepers on both ends of this move care for these animals with as much devotion and empathy as you can imagine. It’s this mushy stuff that is sometimes left out of our stories. As zoologists we like to focus on the hard science behind animal care, but I can tell you that all four of us had a few tears in our eyes as we left the lionesses with their new keepers. Like seeing a kiddo head to kindergarten, it was a bittersweet little moment. For me, the most touching moment was seeing Pam hand off to the Hogle keepers the girls’ favorite enrichment toy, a football that Pam had given them as little cubs back in Seattle. 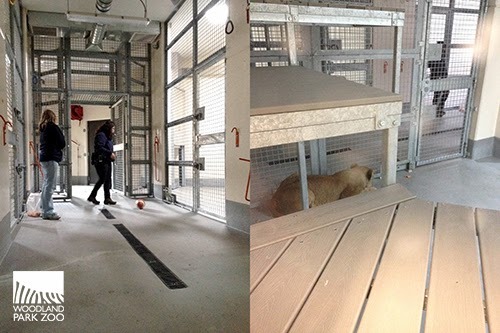 Pam, Jason and Martin took one last peek into the lions’ new home. They were in good hands and it was time to make the long drive home. Pam leaves a little good luck present for Busela and Nobuhle: their preferred football, a reminder of their keeper at Woodland Park Zoo. Here you can see Nobuhle peeking out from an indoor holding area. It’s hard to believe the time has come to see our four young lions move onto the next stage of their lives. Born in November 2012, brothers Pelo and Rudo and sisters Busela and Nobuhle are now nearly the size of their mother, Adia. Our lions are still young, but at a year+ they were ready to become independent and start their own adventures. Part of becoming a mature lion means having the chance to establish a family and the potential to have cubs of their own. Nobuhle in a holding area behind-the-scenes at Hogle Zoo. Busela in her holding area at Hogle Zoo. Photo courtesy of Hogle Zoo. As we drove out of the zoo gates, this Fleetwood Mac song was playing on the radio and I thought it was an auspicious sign for our girls. I couldn't help but smile and think of the good life our girls will have in Utah. I might be secondhand news to our lions, but after this adventure I will always think of them whenever I find myself road tripping. If you happen to find yourself in Salt Lake City, make sure you stop by Hogle Zoo and say hello to the girls! Though the cubs have now all gone, the lion story isn’t over. 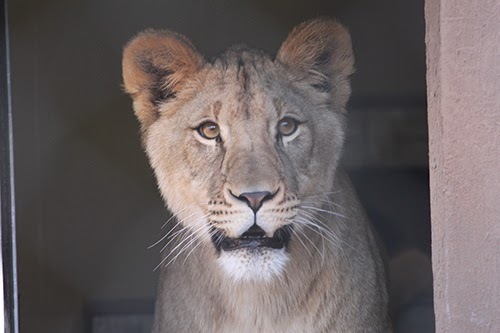 A new mate for Adia has just arrived here from El Paso Zoo, a handsome male named Xerxes. He is hanging out in standard quarantine right now and we’re gearing up for an introduction between the two very soon. The two are paired through the Species Survival Plan, and if they hit it off, we could have a whole new generation of cubs to fall in love with! Detailed, thought-provoking, AND fun to read! What a great article! Thanks - great article! I was especially interested in all the logistical details of your trip, and I loved the interviews with the Hogle Zoo staff. After watching them grow up, I love to hear about their new homes and how they are doing! I saw these lions at Woodland Park last September and I will be visiting the Hogle Zoo in June. Can't wait to see them at SLC. I was born and raised in Salt Lake City. As a child and even as an adult I love the zoo, I enjoy it even more now that they have renovated some areas and updated some of the animals habitats. I have been looking forward to the new African savanna since it was announced, especially since they will be adding the new Lions, as the large cats are one of my favorites. I haven't been to the Woodland Park Zoo yet, since my patents moved to Woodinville in 1998. I still want to go! Sad day for you there, but happy for us here in Utah! My family and I can't wait until the new exhibit is open at Hogle...we've been anxiously waiting and peeking through the construction fence for the past two years! Looking forward to hearing their roars of approval on new home!!! Thanks for this article! It's neat to hear about the work and care that goes on behind the scenes. My family and I visit Hogle zoo often and can't wait to visit your beloved lion sisters. My two daughters will love hearing the story of how they came to our zoo. Never realized how difficult it is to move animals from one location to another. The Budget rental looks pretty safe and sturdy however. Glad everyone made it safe and the animals are happier now.